This is a single port Power-over-Ethernet (POE) 10/100Base-T Injector. 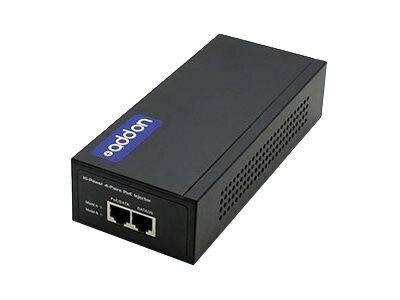 This device helps eliminate the need for a POE enabled equipment switch, and add POE items such as wireless LAN, Bluetooth Access Points, and many IP function devices. The injector is typically installed near the Ethernet hub and connected to a remote POE device through a single Ethernet Cat 5e, Cat6, or Cat6a cable. The injector can support an advanced 802.3af or nonstandard (optional) compliant device which support the standard POE pin out. This AC/DC powered POE Injector is a power sourcing equipment (PSE), which combines data transferred over a fiber optic link with 48V power supply, providing power to IEEE802.3af powered device (PD) over CAT5e, Cat6, and Cat6a UTP cable (cable length up to 100 meters / 330 feet). It complies with the IEEE802.3af standard. The media converters and network interface cards are 100% compliant for all of the networking needs. Now you have a cost effective solution to your network upgrade needs. With the certification test program, your product will work right the first time.